Hey Friends! How are you doing lately? I saw this page today and I thought many could relate and or benefit from it. I didn’t write it, but I love it. It’s called “I Don’t Look Sick”. 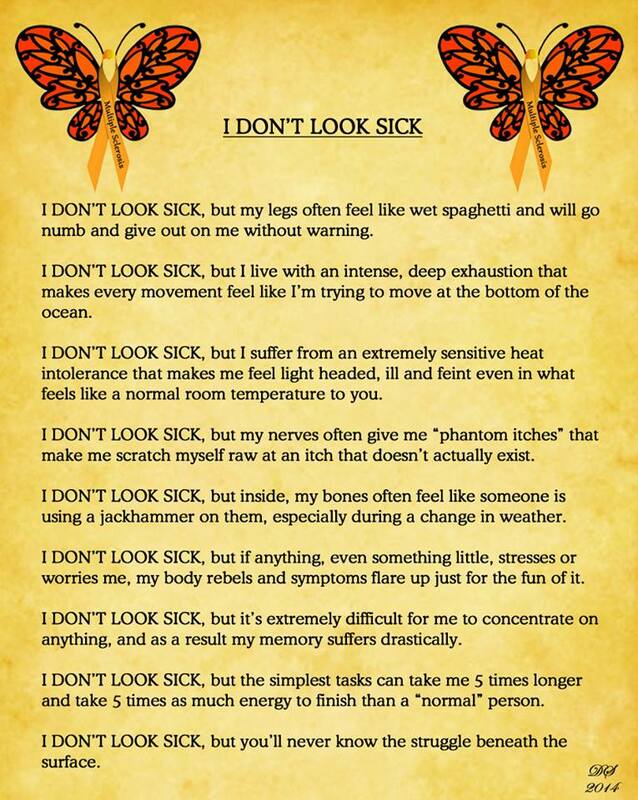 The graphic is originally from this site: http://patienttalk.org/i-dont-look-sick-please-share-this-brilliant-graphic-from-donnee-spencer-telling-us-about-life-with-am-invisible-illness/ What do you think about it??! This really hit home for me. Despite the fact that I have had over 30 surgeries due to a car accident and now am suffering from hypoglycemia, hypothyroidism, COPD and am on oxygen 24/7, people (family included), still tell me that I need to push myself harder. They don’t understand that the more I do, the more energy I burn, hence the reason why I am always so drained. Thank you for sharing this. Anytime, Rhonda. I can’t imagine how you *wouldn’t* be drained with all the medical issues you have going on in your life!